A renowned California court decision in 2014 declaring that teacher tenure laws violated the state constitution has highlighted the issue of tenure and its relationship to the allocation of teachers across schools (Vergara v. State of California 2014). This debate is rooted in a deeper discussion about whether disadvantaged children are taught by less-credentialed, less-effective teachers; whether this misallocation might vary across states and/or districts; and whether it could partly explain socioeconomic achievement gaps (Adamson and Darling-Hammond 2012; Clotfelter et al. 2006; Isenberg et al. 2013; Reardon 2011). Moreover, the question has been raised as to whether teachers’ unions, through collective bargaining or legislation, could to some extent be responsible for this misallocation (Moe 2011; Vergara v. State of California 2014; Whitehurst, West, Chingos, and Dynarski 2015). This paper explores these issues using nationally representative data on schools and teachers from the 2011 National Assessment of Educational Progress (NAEP). First, it examines the extent to which there is a misallocation of teachers in terms of a gap between the qualifications of teachers in schools in general versus the qualifications of teachers in high-poverty schools, defined as schools in which over half of students are eligible for free or reduced-price lunch. The observable credentials of interest are the teacher’s years of experience, educational background in the subject taught, and certification. We selected these variables based on evidence of their association with more effective teaching (Darling-Hammond 1999; Ladd and Sorensen 2014). Also, they match with the federal definition of “highly qualified” teachers (see the U.S. Department of Education’s Educator Equity Profiles). Almost half (47.7 percent) of U.S. public schools are high-poverty schools. The share is over two-thirds in Mississippi, Washington, D.C., New Mexico, Louisiana, Arkansas, Alabama, Oklahoma, Tennessee, and Florida, and less than 20 percent in Nebraska, Utah, Iowa, Minnesota, Wyoming, North Dakota, and New Hampshire (it is only 5 percent in the last state). The credentials of teachers in schools overall are better than the credentials of teachers in high-poverty schools. The misallocation in terms of teacher experience is greatest in Connecticut, Virginia, Nebraska, New Hampshire, Maryland, Minnesota, Pennsylvania, and New York. In terms of educational background, the gaps are largest in New Hampshire, Wisconsin, Pennsylvania, Massachusetts, Ohio, and North Dakota. In terms of certification, the gaps are largest in Virginia, South Dakota, and Maryland. In some states high-poverty schools have more experienced teachers (for example, New Jersey, Ohio, Rhode Island, Wyoming, and North Dakota), more certificated teachers (such as Hawaii and New Jersey), and more teachers with an educational background in the subject taught (such as Iowa, in math). 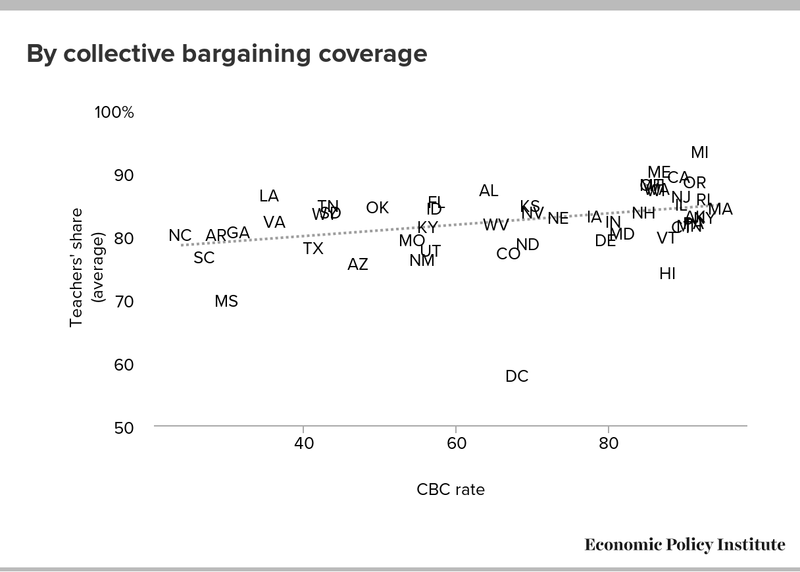 The contention that unions play a role in misallocating resources, sending them away from where they are most needed, is a distraction from efforts to address the persistent nature of achievement gaps between advantaged and disadvantaged students. Disentangling the relative importance of individual, school, community, institutional, and contextual factors in explaining these inequalities should be a primary step in guiding policy. With this goal, we should pursue research that provides further insights on why teachers sort the way they do, which other aspects of school finance and school quality (e.g., facilities, access to advanced classes, curriculum, climate, etc.) differ between high-poverty schools and others, and how these resources influence student performance gaps. Some studies have examined whether disadvantaged students attend schools that are not equal to those of their advantaged peers in terms of financing and access to education resources (teachers and school quality). In particular, the literature has suggested that children who are economically disadvantaged or who are racial minorities are taught by less-credentialed and/or less-effective teachers (Adamson and Darling-Hammond 2012; Clotfelter et al. 2006; Darling-Hammond 2004; Isenberg et al. 2013), and that this teacher misallocation could potentially drive some of the achievement gaps (Reardon 2011; Sass et al. 2012). In addition to differences in observable credentials, another way to estimate misallocation of teacher quality is to examine measures of teacher effectiveness, mostly associated with teacher value-added estimates. These studies tend to indicate that teachers’ average effectiveness in high-poverty schools is lower than in low-poverty schools (Goldhaber, Lavery, and Theobald 2014; Isenberg et al. 2013; Sass et al. 2012). In a study of teacher quality in Florida and North Carolina, the authors estimated that the differences in average teacher quality across high-poverty schools (defined in the study as those in which 70 percent or more of students are eligible for free or reduced-price lunches) and low-poverty schools vary from 1 percent to 7 percent of a standard deviation in Florida and from 1 percent to 2 percent of a standard deviation in North Carolina (Sass et al. 2012). The evidence also suggests that there is greater variation in teacher quality among high-poverty schools themselves (Sass et al. 2012). However, when trying to reconcile the two available estimates of teacher quality, two important caveats arise. On the one hand differences in credentials—teachers’ experience, certification status, and educational attainment—“explain at most one-fourth of the difference in teacher quality across high and lower-poverty schools” (Sass et al. 2012, 105). On the other hand, value-added estimates are sensitive to the model specification, especially to the inclusion of peer effects (Isenberg et al. 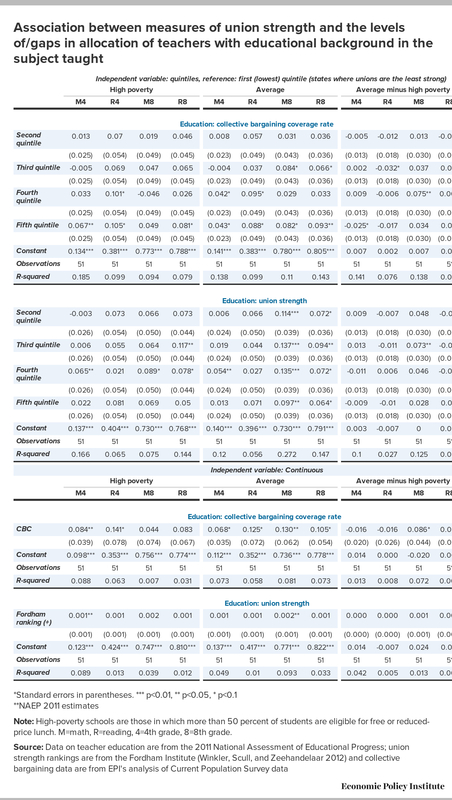 2013, 38–39) or to effects of unmeasured school characteristics (Sass et al. 2012, 110). Overall, these studies support three main findings. One, even though most of the estimates refer to particular districts or states (and thus an average estimate of the misallocation of teacher quality across states is not shown), the evidence consistently points out statistically significant differences in the quality of teachers serving disadvantaged and other students. Second, while there is complete agreement and evidence about the importance of teachers for student learning (Rivkin, Hanushek, and Kain 2005), there is less agreement on how to measure teacher quality, how it contributes to student learning, whether such a contribution is the same for all types of students, and whether it could close achievement gaps.3 Third, the empirical studies point to unequal allocation of resources besides teacher quality, such as access to advanced-placement classes, safety, etc., that can also affect achievement gaps (Office of Civil Rights 2014). Less clear from existing studies is what factors determine the misallocation of teacher quality and the resulting impact on achievement gaps. These factors could include both teacher preferences and a variety of institutional factors.4 It has been frequently claimed that tenure laws and the transfer rights and seniority provisions in teachers’ collective bargaining contracts drive the teacher quality problems faced by disadvantaged students. This claim, however, has not been examined in depth empirically, either directly or indirectly. For instance, various analysts contend that teacher tenure laws—or, in general, a union’s protection of the teaching profession—cause systemic problems, including “teacher quality issues and persistent achievement gaps” (as synthesized in D’Amico 2014), are “practically the sole causes of underperforming schools,” or are “impeding quality schools” (as mentioned in Goldstein 2014, loc.123 and 2559). This view is represented in research by Moe (2011), by Whitehurst et al. (2015), and by various voices in policymaking and advocacy.5 The reasoning behind this argument is that contracts grant teachers the option to transfer from schools with less-agreeable conditions to schools with more-agreeable conditions on the basis of seniority (not tenure). This option would facilitate or somehow induce a redistribution of teachers away from high-poverty schools, where presumably the working conditions are relatively tougher, and thus facilitate or somehow induce unequal sorting and misallocation of teacher quality. Ravitch (2006) dismisses this argument by noting that teacher tenure laws were not invented by unions and never really protected teachers, nor, as D’Amico (2014) points out, were they supposed to. Indeed, teacher tenure provisions, which predate teachers unions, exist in states without collective bargaining rights. As Ravitch (2006) notes, tenure policies do not ease or necessarily even cover transfers, and seniority does not always play a role in teacher transfer rights.6 Moreover, as Moore-Johnson et al. (2007) argue, some unions, in collaboration with management, may play a significant role in promoting teaching quality via teacher dismissal policies, promotion of the use of rigorous evaluation of teachers, and encouragement of staffing in hard-to-attract schools. Examples include initiatives such as peer assistance and review to observe and increase teacher quality, and strategies that pursue adequate staffing in hard-to-staff schools (Moore-Johnson et al. 2007; NEA Foundation 2012).7 Empirical work along these lines includes Baker (2012) and Koski and Horng (2007), among others. A detailed commentary by Baker (2012) dismissed any relationship between union strength on the one hand and funding levels and equity on the other. 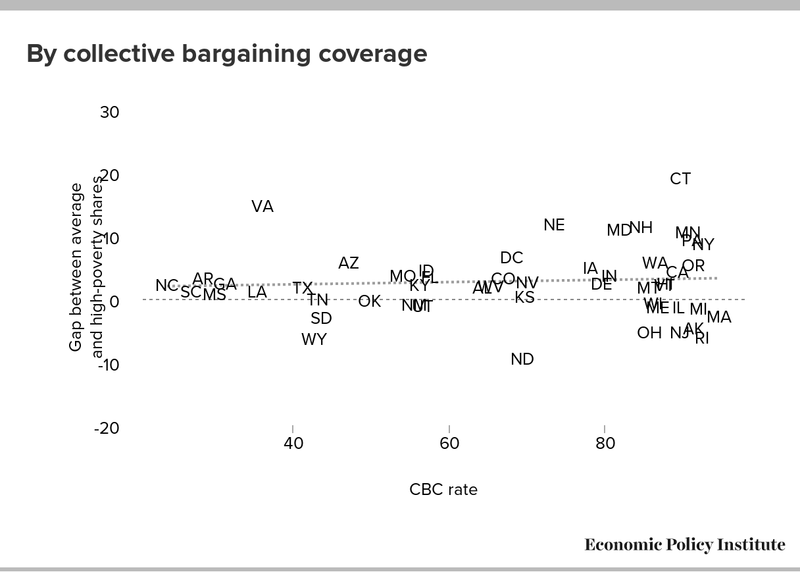 The correlations (it is worth emphasizing that, like ours, Baker’s paper does not tackle the causality question) show that states with stronger teachers unions tend to have more adequate and equitable funding levels than states with weaker unions. His findings also suggest that income-adjusted performance for nonpoor students in states with weak unions is lower than in states with strong unions, and that there is no adverse relationship between the strength of unions and achievement gaps between poor and nonpoor students in the states. But Hoxby (1996) came to the opposite conclusion, finding that teachers unions raise school budgets and inputs but lower student achievement by decreasing the productivity of inputs. Lott and Kenny (2013), who used statewide teachers union dues and spending to identify states with strong unions, concluded likewise; they found that students in states with strong unions had lower test scores than students in states with low dues and spending. In this paper we add to this literature by using basic analytic methods to examine whether disadvantaged children are taught by less-credentialed teachers and, if so, whether there is any variation in this trend across states. We also examine whether teachers unions, through either collective bargaining or legislation, are associated with an allocation of teachers that disadvantages students in high-poverty schools. The empirical analyses rely on teacher credential data from the 2011 National Assessment of Educational Progress (NAEP) by the National Center for Education Statistics (NCES) and on two measures of teachers union strength, one computed from the Current Population Survey (2009–2013) and the other based on the Fordham Institute’s ranking of union strength (Winkler, Scull, and Zeehandelaar 2012). From NAEP, using a sample of public (noncharter) schools, we obtain the distribution of schools based on the proportion of students eligible for free or reduced-price lunch (FRL) in the school. High-poverty schools are considered to be those in which over 50 percent of students are FRL-eligible. We distinguish them from low-poverty schools (up to 25 percent eligible) and moderate-poverty schools (26–50 percent eligible). Also using NAEP, we calculate the credentials of teachers of mathematics and reading in both the 4th and 8th grades in public schools. The credentials of interest include years of experience, educational background, and type of teaching certificate. Specifically, teachers are considered experienced if they have five or more years of experience. They are considered subject experts if they have educational background in the subject taught (for math, if the teacher has a major or minor in math as an undergraduate or graduate; for reading, if the teacher has a major or minor as undergraduate or graduate in reading, language arts/English, other language arts, or English-language learning). And they are considered certified if they have a regular/standard teaching certificate. We focus on three measures of teacher quality—the proportion of teachers with at least five years’ experience, with certification, and with a major or minor in their subject matter—and examine teachers in each of the four grade/subject combinations (math 4th and 8th; reading 4th and 8th). In order to assess whether teachers are misallocated in high-poverty schools, we compare the proportion of teachers having each of the three quality measures (experience, credentials, major or minor in field) in high-poverty schools relative to the average proportion across all schools in the state. We refer to these differences as “gaps” and focus our analysis on the relationship between teachers union strength and these gaps across the states. 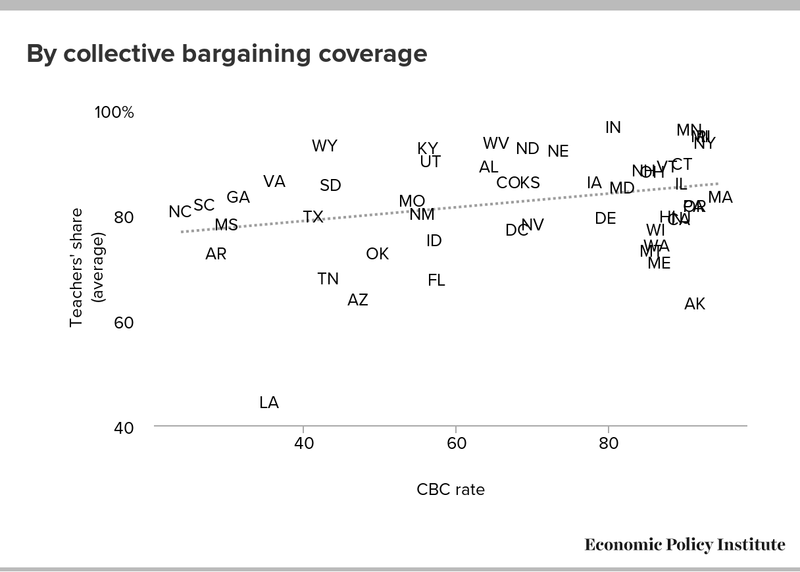 We use two different measures of the strength of unions in each state, and the measures are highly correlated (see Figure A).10 In particular, the collective bargaining coverage (CBC) rate from the Current Population Survey measures the proportion of teachers covered by collective bargaining, as opposed to having actual union membership. (Specifically, the sample is from the CPS ORG data on full-time public K-12 teachers with at least a bachelor’s degree and with imputed or nonimputed positive weekly earnings, for a pooled sample from 2009–2013.) 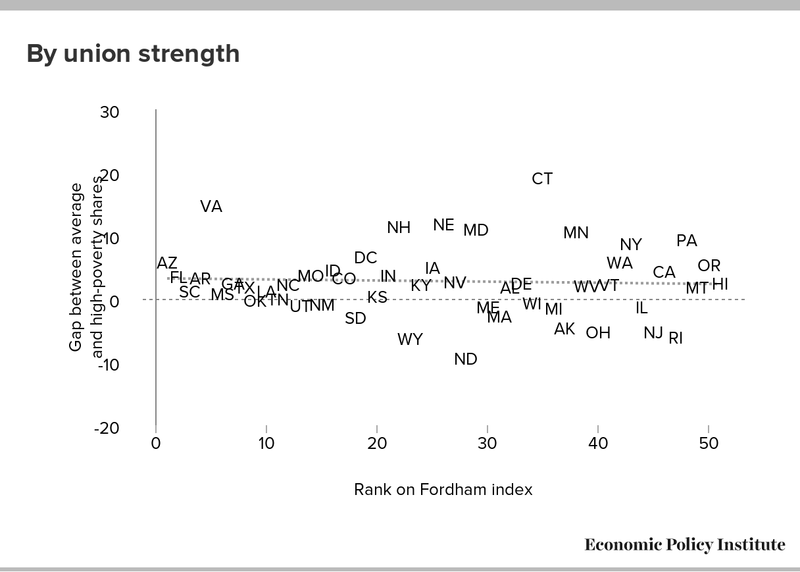 Fordham’s index reflects an assessment of a wide variety of dimensions of union strength; higher values show states with stronger unions.11 In our analyses we deploy these variables as either a continuous or a categorical variable. 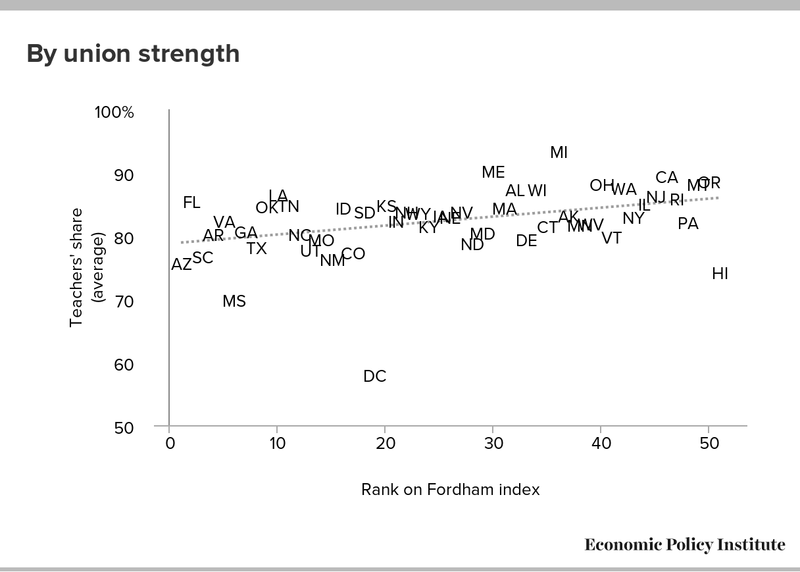 Our categorical analyses rely on states being assigned to quintiles based on a ranking of union strength, allowing us to compare the states at the bottom quintile of union strength with those in successively stronger quintiles. 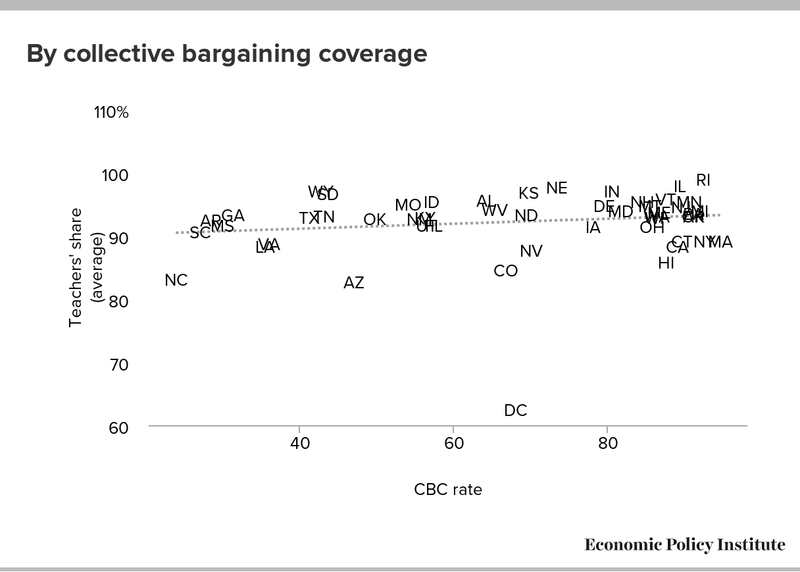 The use of the categorical specification provides a mechanical but probably more realistic test of the role of unions: instead of testing whether there is a different outcome in states per percentage-point difference of union coverage, say 38 percent rather than 37 percent, which is predetermined to be the same as between 60 and 61 percent, the test is whether states with strong unions (high CBC) have different outcomes than those with very little collective bargaining coverage (low CBC). In sum, our analyses are essentially descriptive, presenting plots of relationships across states and offering some regressions using one explanatory variable (various measures of union strength) and three teacher-quality measures in four subject/grade combinations. We view these analyses as a first cut at examining the empirical relationship between unions and teacher quality allocation. It might be the case that developing alternative specifications with more controls could result in different outcomes. We view the fact that our multiple ways of examining the relationship between unions and teacher quality allocation yield the same conclusion—that there is no relationship between union strength and teacher quality misallocation—as a strong indication that other more robust analyses would yield a similar conclusion. Results are discussed in the next section. We start with some basic descriptive results (Table 1). First, almost half of U.S. public schools (47.7 percent) are high-poverty schools, i.e., schools in which over 50 percent of the student body is eligible for free or reduced-price lunch. The concentration of high-poverty schools varies widely across states. While less than 20 percent of schools are high poverty in New Hampshire, North Dakota, Wyoming, Minnesota, Iowa, Utah, or Nebraska, over two-thirds of schools in Mississippi, D.C., New Mexico, Louisiana, Arkansas, Alabama, Oklahoma, Tennessee, and Florida have more than half of their student bodies in FRL status. These differences obviously constitute very different scenarios for the provision of education and associated resource and funding needs. Note: Charter schools are not included. Source: 2011 National Assessment of Educational Progress (NAEP) microdata from the National Center for Education Statistics (NCES). Data from schools operated by the Department of Defense for the children of service members are excluded. Table 2, which looks at 8th-grade math teachers in 2011, provides two ways of computing the gaps in teacher allocation. 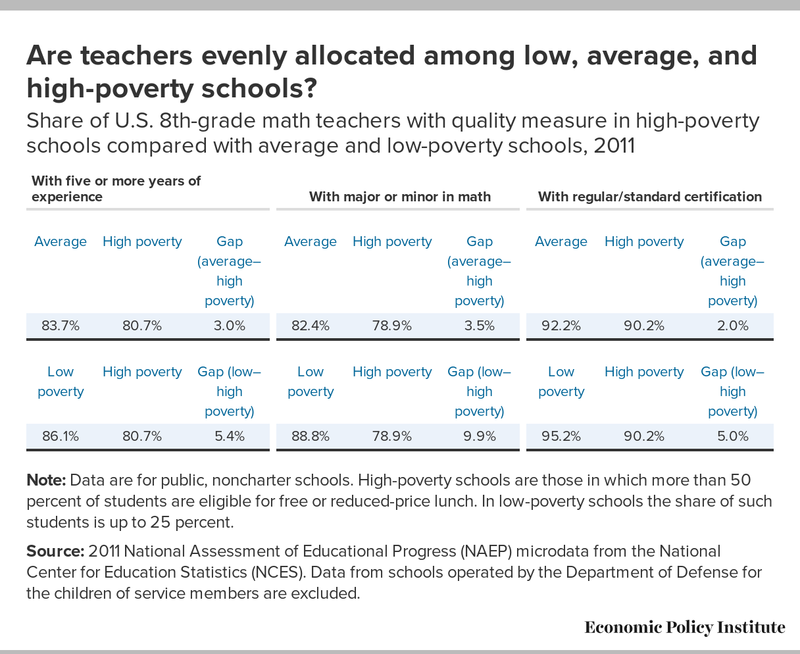 The top panel compares teacher quality in high-poverty schools and the “average” school. For instance, we see that, on average, 83.7 percent of teachers in public schools had five years or more of experience, 82.4 percent had an educational background in math, and 92.2 percent were certified. In contrast, high-poverty schools had three percentage points fewer teachers (83.7 percent versus 80.7 percent) with five or more years of experience. Also, fewer teachers in high-poverty schools had a degree in the subject they taught (78.9 percent, 3.5 percentage points less than the average) and 90.2 percent of teachers were certified (a gap of 2 percentage points). Note: Data are for public, noncharter schools. High-poverty schools are those in which more than 50 percent of students are eligible for free or reduced-price lunch. In low-poverty schools the share of such students is up to 25 percent. Table 3 shows the substantial variation across states in the gaps between teacher-quality shares in high-poverty and average schools. For example, the results show substantial misallocation of experienced teachers (large gaps between their shares on average compared with in high-poverty schools) in Connecticut, Virginia, Nebraska, New Hampshire, Maryland, Minnesota, Pennsylvania and New York (from 19 to about 9 percentage points of difference). In terms of teachers’ educational background, New Hampshire (with a 40 percentage-point gap), Wisconsin, Pennsylvania, Massachusetts, Ohio, and North Dakota have the largest misallocations. With respect to teacher certification, the gaps tend to be smaller, with only Virginia, South Dakota, and Maryland reaching a roughly 10 percentage-point difference in the proportion of teachers with a certificate in high-poverty schools compared with the average. In some states high-poverty schools have more experienced teachers (New Jersey, Ohio, Rhode Island, Wyoming, and North Dakota, on the order of 5 to 10 percentage-point differences), more certificated teachers (Hawaii and New Jersey, 5 to 13 percentage points), and more teachers with an educational background in math (Iowa, 4.5 percentage points). Note: Data are for teachers in public, noncharter schools. High-poverty schools are those in which more than 50 percent of students are eligible for free or reduced-price lunch. Gaps may not sum due to rounding. As in Table 2, we limit our graphical presentation (Figures B–D) to the results for 8th-grade math teachers, but the results are comparable for the other grade/subject groups. For each measure of teacher quality we plot each of the two measures of union strength against (1) the proportion of teachers in high-poverty schools who have that quality; (2) the proportion of teachers with that quality across all schools on average; and (3) the gap between the proportion of teachers with that quality in all schools and the proportion with that quality in high-poverty schools. 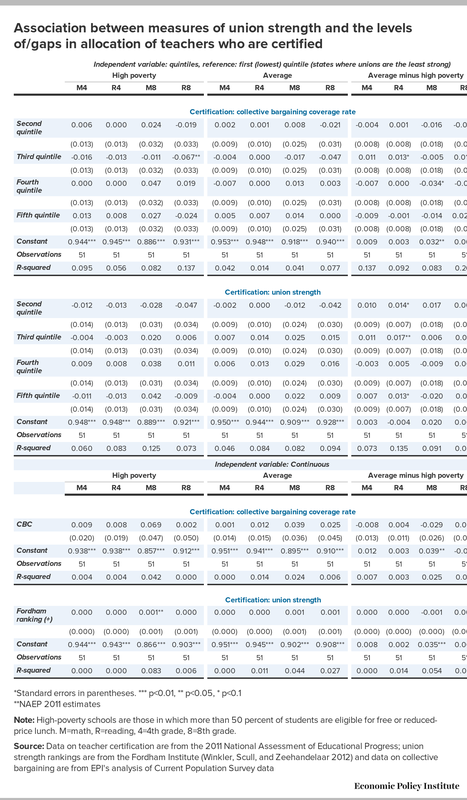 In the top two panels of each figure, the vertical axis shows higher teacher quality the further up the axis and the horizontal axis shows greater union strength moving to the right (one column for each union measure). Therefore, if teacher quality declined with union strength, we would expect to see a downward-sloping line in each graph. The bottom pair of graphs in each set shows the allocation gap, with the vertical axis this time showing a greater gap between all schools and high-poverty schools the further up the axis: therefore, an upward sloping line indicates that states with stronger unions have larger gaps in teacher quality allocation. We follow each set of figures on the particular quality measure with a table presenting regression statistics (tables 4–6). Regressions are presented for each of the three variables, as listed above, but for every subject/grade combination (three dependent variables, four subject/grades). The regression is specified with the union variable as a set of dummies indicating levels of union strength—broken down into quintiles (fifths)—with union strength rising as the fifth gets larger (the fifth “fifth” has the strongest unions), and the omitted category represents the weakest unions. 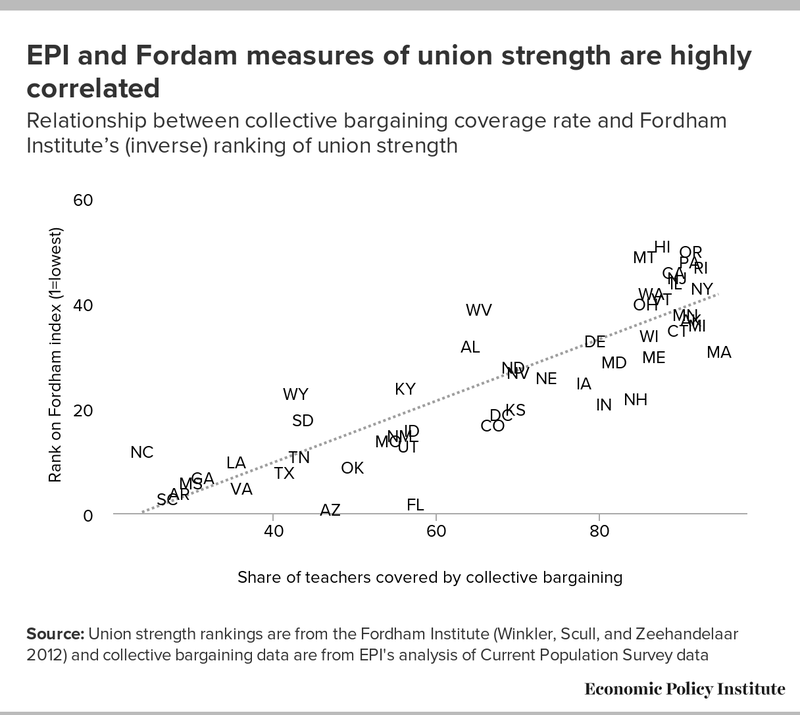 This exercise is repeated for the collective bargaining coverage measure in the top panel and the Fordham measure of union strength in the bottom panel. We also conduct these exercises using the two union variables as continuous variables (proportion of teachers with collective bargaining coverage and the ordinal ranking of the Fordham measure), which coincide with the slope of linear adjustment shown in the figures (for all the combinations of teacher qualities, grades, subjects, and union variables). For each teacher quality, this method provides a total of 24 tests of correlations between teacher quality and union strength for the quintile regressions, and another 24 tests of correlations for the continuous variables. 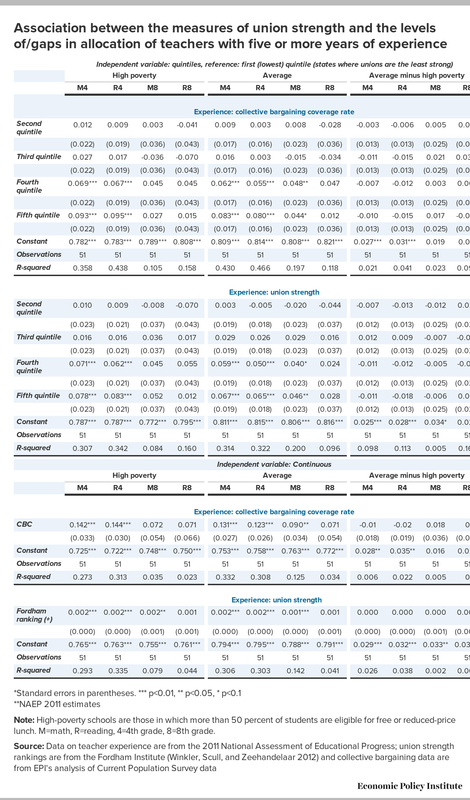 We focus our discussion, however, on the last four columns, which present the results for the allocation of teacher quality in all the schools versus high-poverty schools (columns called “Average minus high-poverty”). A more detailed examination of the results allows us to point out other correlations of interest, as well as a few exceptions to the main stated findings. Looking at the misallocations (right panels on the regression tables using quintiles), the previous conclusions would hold for all credentials, grades, and subjects with just a few exceptions. For instance, we find some positive and some negative statistically significant coefficients that indicate union strength has an impact. These exceptions are few and they run in both directions, indicating that stronger unions are sometimes associated with a more favorable and sometimes with a less favorable allocation of teacher quality for disadvantaged students. 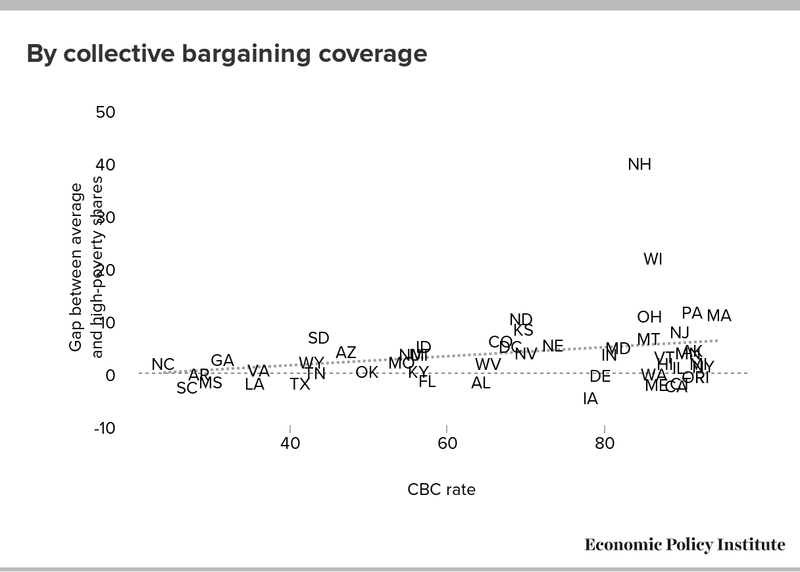 In experience (reading, 8th grade), in states with unions on the third quintile as per the collective bargaining coverage measure, the gap between teachers’ experience in average schools and high-poverty schools is larger than the gap in states with the weakest unions. 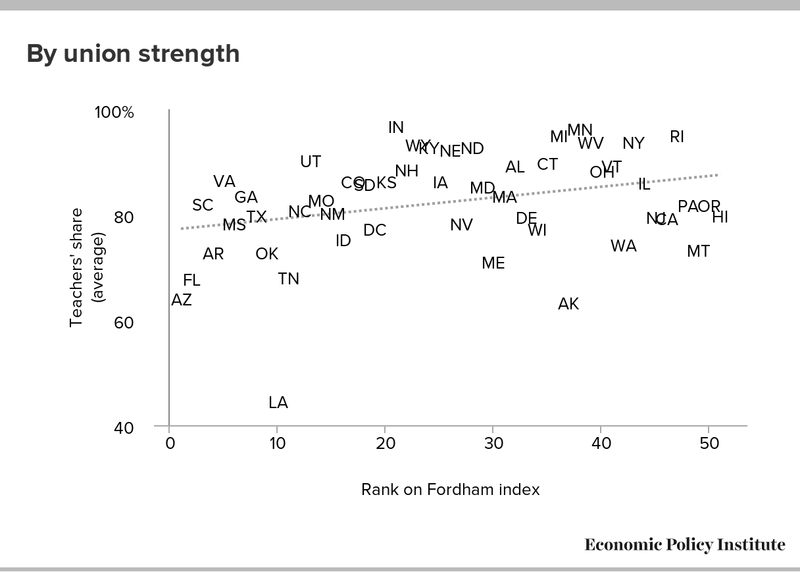 In education, also as per the bargaining agreement variable, in states in the fourth quintile the gap between teachers’ background (math, 8th grade) in average schools and high-poverty schools is larger than the gap in states with the weakest unions (the comparison of states in the third quintile of union strength using the Fordham index and states at the bottom produces a similar finding). However, in states in the third quintile the gap between teachers’ background (reading, 4th grade) in average schools and high-poverty schools is smaller than the gap in states with the weakest unions, indicating union strength is associated with less misallocation. 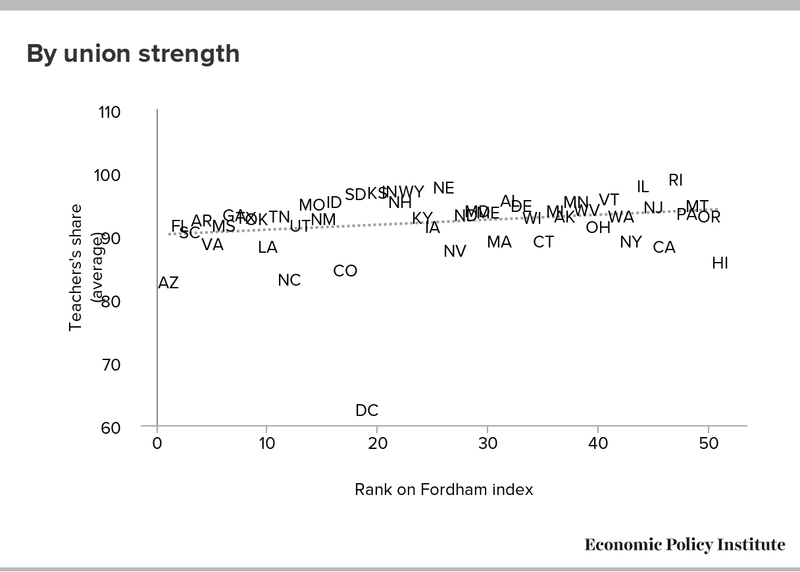 There are some positive coefficients, as reflected by the Fordham index, in the misallocation of teachers according to their certificate and reading teachers in 4th grade, and some according to the bargaining agreement variable and reading teachers in 8th grade, but a negative coefficient (indicating union strength associated with teacher quality allocations more favorable to disadvantaged students) in the fourth quintile associated with states with strong unions and math teachers in 8th grade, relative to states with the weakest unions. Note: High-poverty schools are those in which more than 50 percent of students are eligible for free and reduced-price lunch. 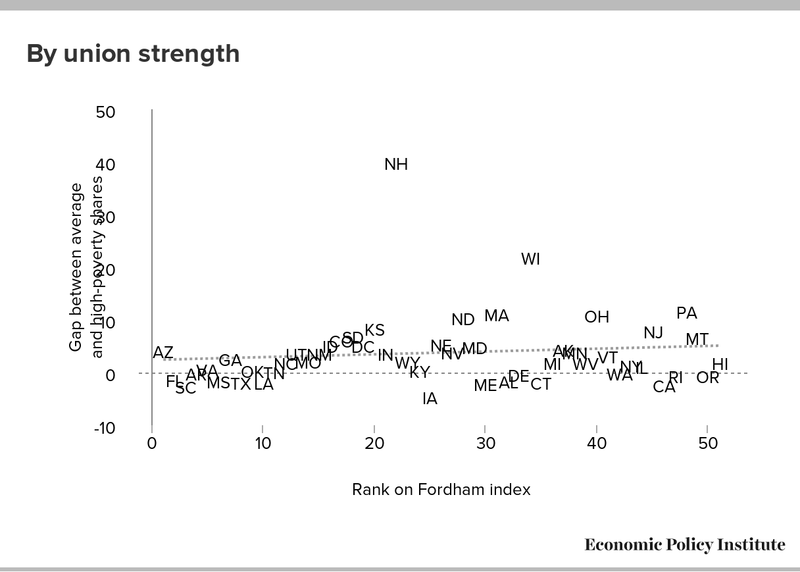 On the inverse Fordham index of union strength, 1 is the lowest value. 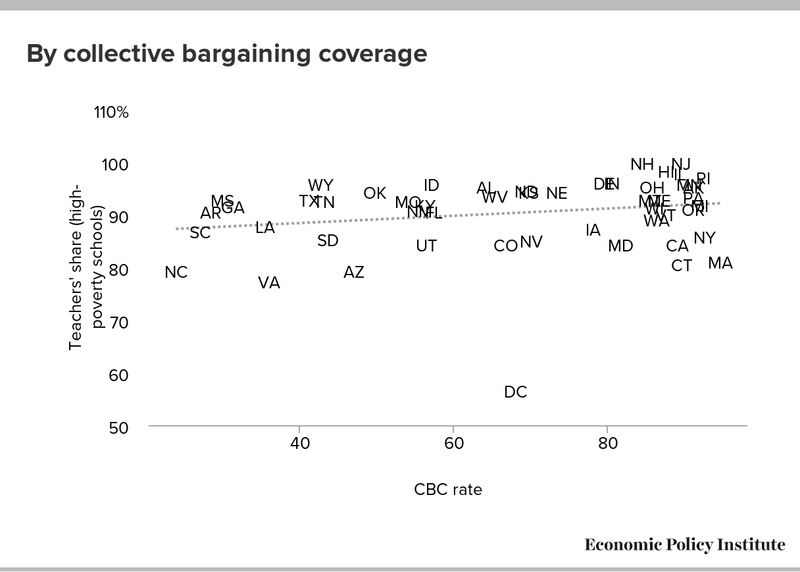 The CBC rate is the share of teachers covered by collective bargaining. Note: High-poverty schools are those in which more than 50 percent of students are eligible for free or reduced-price lunch. 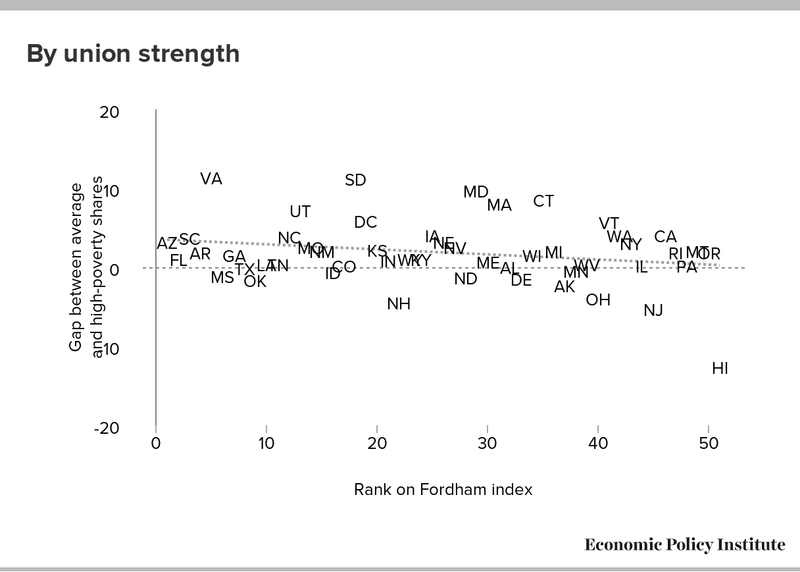 On the inverse Fordham index of union strength, 1 is the lowest value. 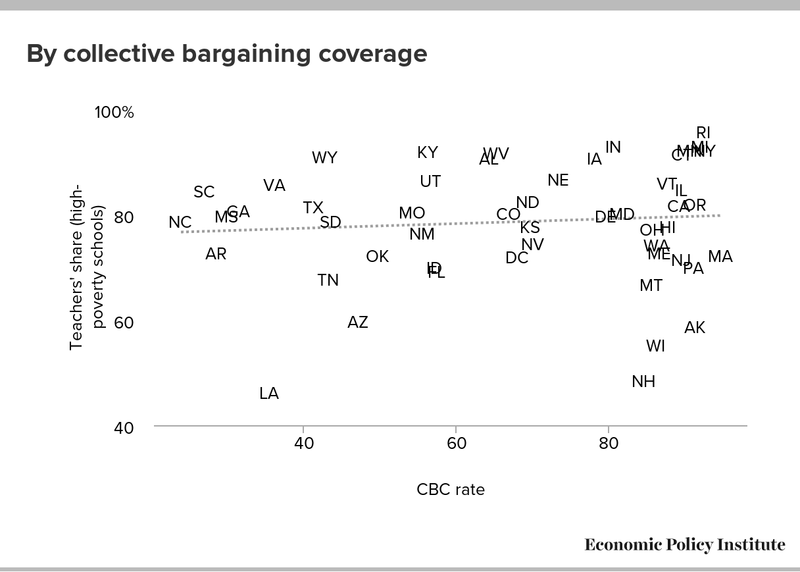 The CBC rate is the share of teachers covered by collective bargaining. Note: High-poverty schools are those in which more than 50 percent of students are eligible for free or reduced-price lunch. M=math, R=reading, 4=4th grade, 8=8th grade. It is important to address the persistent nature of achievement gaps between advantaged and disadvantaged students (see Reardon 2011, among others). If individual, school, community, institutional, and contextual factors could be contributing to these gaps, exploring all the factors and disentangling their relative importance in explaining educational inequality would constitute a prime step in guiding policy. Our research sheds light on both the extent of teacher misallocation in high-poverty schools and whether such misallocations are associated with strong teachers unions. Our findings reveal three important facts or patterns in this regard. First, 47.7 percent of U.S. public schools are high-poverty schools, defined as those in which more than half of the student body is eligible for free or reduced-price lunch. The concentration of high-poverty schools varies significantly across the states: for example, in Mississippi, Washington, D.C., New Mexico, Louisiana, Arkansas, Alabama, Oklahoma, Tennessee, and Florida, over two-thirds of the schools are high-poverty schools. In Nebraska, Utah, Iowa, Minnesota, Wyoming, North Dakota, and New Hampshire, the proportion of high-poverty schools is less than 20 percent (and only 5 percent in New Hampshire). Obviously, the dimensions of the problem pose multiple challenges for education policy. Indeed, high student poverty and high concentrations of poor children within schools constitute the main obstacle to education equity and performance (Garcia 2015; Putnam 2015; Morsy and Rothstein 2015, among others), and it is important to continually examine how the concentration of poverty and relative poverty may affect students’ performance as well as how equitable finance policies (in education and public policy) have successfully compensated for these disadvantages. An exploration of the economic and public policies that have led to lower proportions of high-poverty schools and better student performance across states would be our first recommendation for educational improvement. Second, we find that the credentials of teachers in schools overall are better than the credentials of teachers in high-poverty schools. Our analysis does not assess whether these gaps are modest or large or what the impact may be for student performance and achievement gaps. Nevertheless, any inequitable allocation (of teacher quality or any other resource) that does not benefit disadvantaged students would increase rather than decrease opportunity gaps. Third, our analyses examine the relationship between two measures of union strength (and measure each one in two ways, continuous and categorical) and three teacher quality credentials for four grade/subject combinations (reading/math, 4th/8th grades) and consistently find that there is no relationship between union strength and teacher quality misallocations adversely affecting disadvantaged students. 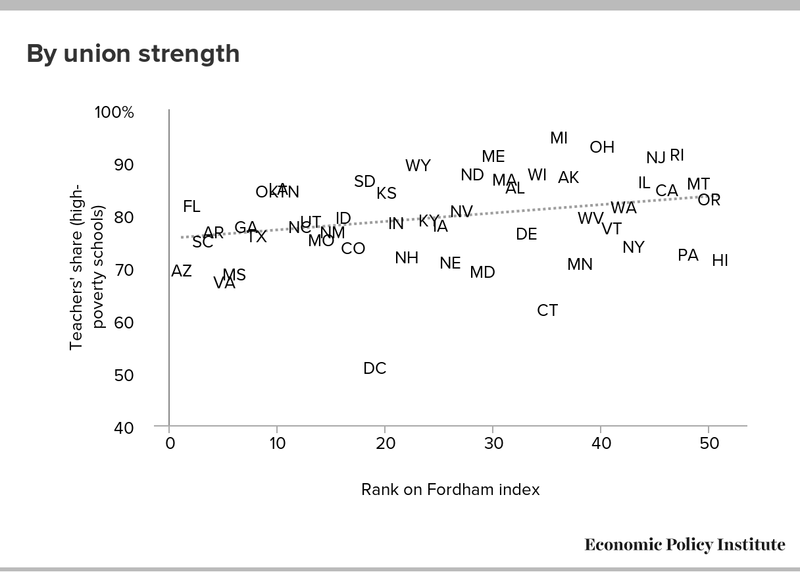 For further research, we propose to examine the correlation between indicators of union strength and student performance across the states in an attempt to explore whether stronger unions correlate with higher or lower state educational performance. We also propose using other types of analysis—such as longitudinal analyses of changes in credentials of teachers in specific districts and/or states and changes in the presence of unions, or perhaps the specific provisions in collective bargaining agreements—to tackle the causal links between unions, the allocations of teachers, and student performance. To reduce inequities, it would also be valuable to gain further insights into why teachers sort the way they do, and the role teachers unions can play in observing and improving teacher quality—through supportive policies that make teaching in high-poverty schools more feasible, less burdensome, or more attractive, or through policies like professional development (see Annenberg Institute for School Reform 2011; Moore-Johnson et al. 2007; Tucker 2012). Finally, with the aim of shrinking achievement gaps, it will be important to address the extent to which other aspects of school finance and school quality—including facilities, access to advanced classes, curriculum, climate, etc.—differ between high-poverty schools and others; how they influence student performance and gaps; and whether their influence is compounded by teacher misallocation. The authors gratefully acknowledge Mark Simon for his advice on earlier drafts of the paper. They are also grateful to Lora Engdahl, Pat Watson, and Michael McCarthy for editing, and to Chris Frazier, Teresa Kroeger, Chris Roof, and Eric Shansby for their work on the figures and tables of the study. They appreciate the assistance of communications staff of the Economic Policy Institute who helped to disseminate it, especially Susan Balding and Elizabeth Rose. 1. Collective agreements usually operate at the school district and not the state level. However, state legislative and policy rules can impact teacher allocation. This analysis is a first cut exploring any evidence supporting or rejecting the mentioned claims that strong teacher unions are associated with skewed teacher quality allocations for high-poverty schools. 2. The analysis also shows that most of the inequities come from teachers sorting across districts and schools as opposed to within schools/across classrooms. 3. As the Institute of Education Sciences points out, in addition to the fact that the correlation between credentials and teacher effectiveness is small, “even existing studies that do measure access to effective teaching using learning gains do so in different ways, making it difficult to synthesize the lessons learned” (NCEE 2014). 4. Regarding how teacher preferences may be driving the misallocation of teachers, the explanations include that teachers are more likely to leave schools with higher concentrations of poor, minority, and/or low-performing students; schools with students with more behavioral problems; schools in which the teachers have less autonomy; and schools in which the teachers receive lower salaries (Guarino, Santibáñez, and Daley 2006). Although it is not clear whether those more willing to leave are of higher quality than those staying (i.e., whether there is selection bias, in which teachers leaving these schools are more likely to be either more credentialed or more effective, or both), research documents that, in general, high teacher turnover in lower-performing schools could disadvantage students in those schools. Since the effectiveness of teachers increases over the first few years of their careers, higher turnover in high-poverty schools would result in a higher proportion of novice teachers in those settings. According to the evidence, 27 percent of first-year teachers in New York City’s lower-performing schools do not return the following year, compared with 15 percent in schools with the highest student achievement (see Boyd et al. 2005). On salaries, for example, a study of North Carolina schools found that bonuses awarded to teachers reduced turnover in high-poverty schools by 17 percent (Clotfelter et al. 2008), and experienced teachers (those with 10–19 years of experience) were most likely to benefit from the program (31 percent). A more comprehensive summary of these studies is provided by Imazeki and Goe (2009). The literature on turnover is summarized in Ronfeldt, Loeb, and Wyckoff (2013) and Hughes (2012). 5. This list is not exhaustive. For example, two quotes reflecting this approach state that: “teacher unions [that are doing what unions] are expected [to do by trying] to protect the less effective of their members from the consequences that follow from exposing their ineptitude in the classroom” (Whitehurst et al. 2015); and “teacher unions are at the heart of these problems” (Moe 2011, 6; “these” refers to “the nation’s education problems”). An allusion to problems aggravated by unions include delaying negotiations for implementation of comprehensive evaluation systems (in New York) that would allow “addressing teacher quality deficiencies, generally, and will create an important tool to address inadequacy and inequity in teacher talent and the way it is distributed across schools” (StudentFirstNY 2013). 6. Tenure provides teachers with due process in the event of dismissal. Teacher transfer rights vary by district and, when based on seniority, give teachers with more experience the option to transfer if an opening in the same school or in another school in the same district is available. The role of seniority in voluntary and involuntary transfers in the contracts or as stated by management varies from district to district. 8. See main effects of CBA provisions in models with district controls. 9. Anzia and Moe (2014) found similar results, though they argue that the results are sensitive to school district size. Their findings contrast with the findings of Koski and Horng (2007) for California and Cohen-Vogel and Li (2013) for Florida; these California and Florida studies found no evidence of the seniority-inequality relationship. 10. The first two columns of Appendix table A-1 are used to construct the correlation graph shown in Figure A. They are, in various forms, the independent variables in our regression analyses. See details below. 11. This index is measured as a ranking in Fordham’s study. The ranking is re-ordered in our study so that a stronger union (a lower ordinal number) is associated with a higher value of the index. We are aware of the limitations of using an ordinal variable when doing the calculations. The analyses were confirmed using the School and Staffing Survey’s proportion of unionized teachers and an index of resources/members, and other Fordham indices (see values in other columns in Appendix Table A-1). Results are available upon request. 12. Results using indicators of teacher quality from the U.S. Department of Education’s Educator Equity Profiles are available upon request. 13. All these gaps are slightly larger if we compare high- with low-poverty schools: the percentages of teachers with over five years of experience, educational background in subject taught, and certification are 5.4, 9.9, and 5.0 percentage points lower in high-poverty schools than in low-poverty schools, on average. 14. Results are available upon request. 15. 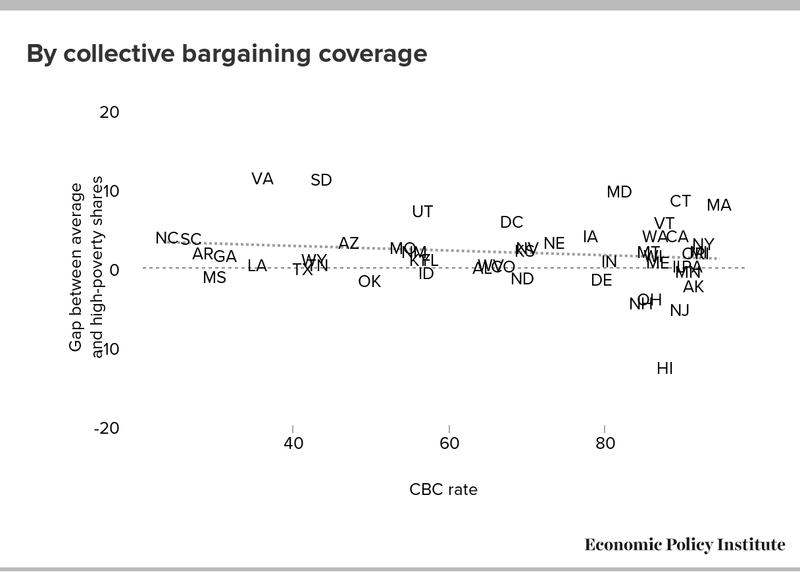 The only exception of the slope of the math-8th grade/education background versus collective bargaining agreement coverage regression, which has a positive slope of 0.086, statistically significant at the 10 percent significance level, suggests union strength leads to less misallocation. 16. With the exception noted above. Adamson, Frank, and Linda Darling-Hammond. 2012. “Funding Disparities and the Inequitable Distribution of Teachers: Evaluating Sources and Solutions.” Education Policy Analysis Archives, vol. 20, n. 37. Annenberg Institute for School Reform. 2011. Straight Talk on Teaching Quality: Six Game-Changing Ideas and What to Do about Them. Providence, R.I.: Brown University. Anzia, Sarah F., and Terry M. Moe. 2014. “Focusing on Fundamentals A Reply to Koski and Horng.” Educational Evaluation and Policy Analysis no. 36 (1):120–123. Baker, Bruce. 2012. “Teachers Unions: Scourge of the Nation?” School Finance 101 (Bruce Baker blog), November 10, updated January 29, 2015. Boyd, Donald, Hamilton Lankford, Susanna Loeb, and James Wyckoff. 2005. “Explaining the Short Careers of High-achieving Teachers in Schools with Low-performing Students.” The American Economic Review no. 95 (2):166–171. Clotfelter, Charles, Elizabeth Glennie, Helen Ladd, and Jacob Vigdor. 2008. “Would Higher Salaries Keep Teachers in High-Poverty Schools? Evidence from a Policy Intervention in North Carolina.” Journal of Public Economics, vol. 92, no. 5, pp. 1352–70. Clotfelter, Charles T., Helen F. Ladd, and Jacob Vigdor. 2005. “Who Teaches Whom? Race and the Distribution of Novice Teachers.” Economics of Education Review, vol. 24, no. 4, pp. 377-92. Clotfelter, Charles, Helen F. Ladd, Jacob Vigdor, and Justin Wheeler. 2006. “High-Poverty Schools and the Distribution of Teachers and Principals.” North Carolina Law Review, vol. 85, p. 1345. Cohen-Vogel, Lora, and Li Feng. 2013. “Seniority Provisions in Collective Bargaining Agreements and the ‘Teacher Quality Gap.’” Educational Evaluation and Policy Analysis, vol. 35, no. 3, pp. 324–43. Coleman, J.S., E. Campbell, C. Hobson, J. McPartland, A. Mood, F. Weinfeld, and R. York. 1966. Equality of Educational Opportunity (“The Coleman Report”). Washington, D.C.: National Center for Educational Statistics. Current Population Survey Outgoing Rotation Group microdata. Various years. Survey con­ducted by the Bureau of the Census for the Bureau of Labor Statistics [machine-readable microdata file]. Washington, D.C.: U.S. Census Bureau. D’Amico, Diana. 2014. “The Myth of Teacher Tenure.” Teachers College Record, July 23, http://www.tcrecord.org ID Number: 17620. Darling-Hammond, Linda. 2004. “Inequality and the Right to Learn: Access to Qualified Teachers in California’s Public Schools.” Teachers College Record, vol. 106, no. 10, pp. 1936-66. Darling-Hammond, Linda. 1999. Teacher Quality and Student Achievement: A Review of State Policy Evidence. Seattle: Center for the Study of Teaching and Policy, University of Washington. Duncan, G.J., and J. Brooks-Gunn. 1997. “Income Effects across the Life Span: Integration and Interpretation.” In G.J. Duncan and J. Brooks-Gunn, eds., Consequences of Growing Up Poor. New York, N.Y.: Russell Sage. García, Emma. 2015. Inequalities at the Starting Gate: Cognitive and Noncognitive Skills Gaps between 2010–2011 Kindergarten Classmates. Washington, D.C.: Economic Policy Institute. Goldhaber, Dan, L. Lavery, and R. Theobald. 2015. Inconvenient Truth? 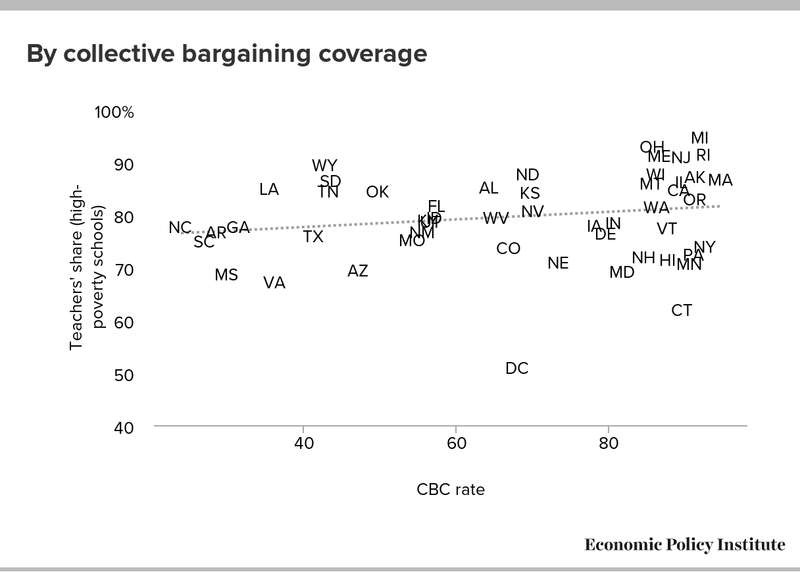 Do Collective Bargaining Agreements Help Explain the Mobility of Teachers Within School Districts? CEDR Working Paper 2015-1. Seattle: Center for Education Data and Research, University of Washington. Goldhaber, Dan, L. Lavery, and Roddy Theobald. 2014. Uneven Playing Field? Assessing the Inequity of Teacher Characteristics and Measured Performance across Students. CEDR Working Paper 2014-4. Seattle: Center for Education Data and Research, University of Washington. Goldstein, Dana. 2014. The Teacher Wars: A History of America’s Most Embattled Profession. New York, N.Y.: Doubleday. Guarino, C.M., L. Santibanez, and G.A. Daley. 2006. “Teacher Recruitment and Retention: A Review of the Recent Empirical Literature.” Review of Educational Research, vol. 76, no. 2, pp. 173–208. Hoxby, Caroline Minter. 1996. 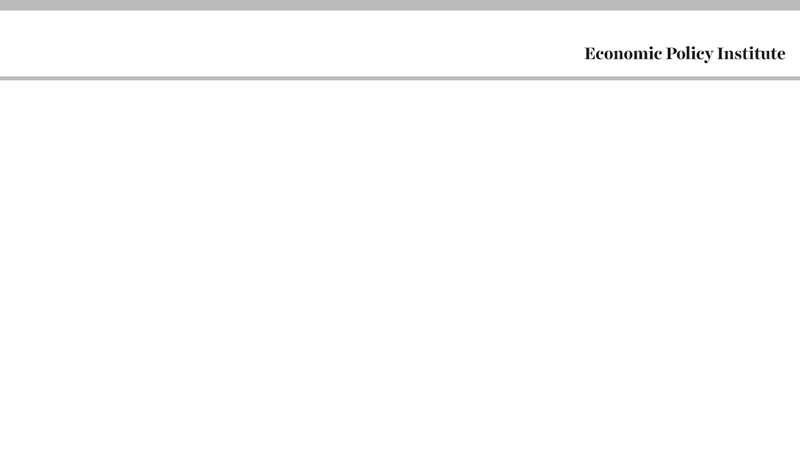 “How Teachers’ Unions Affect Education Production.” Quarterly Journal of Economics, Vol. 111, No. 3, pp. 671–718. Hughes, Gail D. 2012. “Teacher Retention: Teacher Characteristics, School Characteristics, Organizational Characteristics, and Teacher Efficacy.” Journal of Educational Research, vol. 105, no. 4, pp. 245–55. Imazeki, Jennifer, and Laura Goe. 2009. The Distribution of Highly Qualified, Experienced Teachers: Challenges and Opportunities. TQ Research & Policy Brief. Washington, D.C.: National Comprehensive Center for Teacher Quality. Isenberg, Eric, Jeffrey Max, Philip Gleason, Liz Potamites, Robert Santillano, Heinrich Hock, and Michael Hansen. 2013. Access to Effective Teaching for Disadvantaged Students. Washington, D.C.: National Center for Education Evaluation and Regional Assistance, Institute of Education Sciences, U.S. Department of Education. Koski, William S., and Eileen L. Horng. 2007. “Facilitating the Teacher Quality Gap? Collective Bargaining Agreements, Teacher Hiring and Transfer Rules, and Teacher Assignment among Schools in California.” Education Finance and Policy, vol. 2, no. 3, pp. 262–300. Ladd, Helen F., and Lucy C. Sorensen. 2014. Returns to Teacher Experience: Student Achievement and Motivation in Middle School. Washington, D.C.: National Center for Analysis of Longitudinal Data in Education (CALDER). Lankford, Hamilton, Susanna Loeb, and James Wyckoff. 2002. “Teacher Sorting and the Plight of Urban Schools: A Descriptive Analysis.” Educational Evaluation and Policy Analysis, vol. 24, no. 1, pp. 37–62. Loeb, Susanna, Linda Darling-Hammond, and John Luczak. 2005. “How Teaching Conditions Predict Teacher Turnover in California Schools.” Peabody Journal of Education, vol. 80, no. 3, pp. 44–70. Loeb, Susanna, Luke Miller, and James Wyckoff. 2014. Performance Screens for School Improvement: The Case of Teacher Tenure Reform in New York City. Working Paper Series No.31. Charlottesville: EdPolicy Works, University of Virginia. Lott, Johnathan, and Lawrence W. Kenny. 2013. “State Teacher Union Strength and Student Achievement.” Economics of Education Review, vol. 35, pp. 93–103. Moore-Johnson, Susan, Morgaen L. Donaldson, Mindy Sick Munger, John P. Papay, and Emily Kalejs Qazilbash. 2007. Leading the Local: Teacher Union Presidents Speak on Change, Challenges. Washington, D.C.: Education Sector. Morsy, Leila, and Richard Rothstein. 2015. Five Social Disadvantages That Depress Student Performance: Why Schools Alone Can’t Close Achievement Gaps. Washington, D.C.: Economic Policy Institute. National Center for Education Statistics (NCES). 2011. 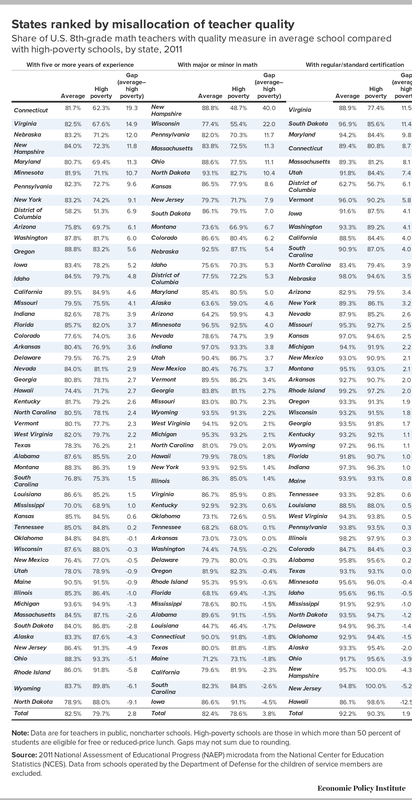 National Assessment of Educational Progress (NAEP) microdata [unpublished data]. NCEE 2014. Do Disadvantaged Students Get Less Effective Teaching? Key Findings from Recent Institute of Education Sciences Studies, Institute of Education Statistics, Washington, D.C.
NEA Foundation. 2012. Peer Assistance and Review: All Teachers on the Road to Instructional Leadership in Columbus (OH) “100% Project Schools.” Washington, D.C.: NEA Foundation. Nores, Milagros. 2006. Gaps in Early Childhood Attainment: Learning the A, B, Cs: Analysis of the 1998 Cohort. New York, N.Y.: Columbia University. Office of Civil Rights, U.S. Department of Education. 2014. Resource Comparability Materials. Papay, John P., Richard J. Murnane, and John B. Willett. 2014. Income-Based Inequality in Educational Outcomes: Learning from State Longitudinal Data Systems. Cambridge, Mass. : National Bureau of Economic Research. Putnam, Robert. 2015. Our Kids: The American Dream in Crisis. New York: Simon & Schuster. Ravitch, Diane. 2006. Why Teacher Unions Are Good for Teachers—and the Public. Washington, D.C.: American Federation of Teachers. Reardon, Sean F. 2011. “The Widening Academic Achievement Gap between the Rich and the Poor: New Evidence and Possible Explanations.” In R. Murnane and G. Duncan, eds., Whither Opportunity: Rising Inequality and the Uncertain Life Chances of Low-Income Children. New York, N.Y.: Russell Sage Foundation Press. Rothstein, Richard. 2004. Class and Schools: Using Social, Economic, and Educational Reform to Close the Achievement Gap. Washington, D.C., and New York: Economic Policy Institute and Comumbia University Teachers College. Rivkin, S.G., E.A. Hanushek, and J.F. Kain. 2005. “Teachers, Schools, and Academic Achievement.” Econometrica, vol. 73, no. 2, pp. 417–58. Ronfeldt, Matthew, Susanna Loeb, and James Wyckoff. 2013. “How Teacher Turnover Harms Student Achievement.” American Educational Research Journal, vol. 50, no. 1, pp. 4–36. Sass, T.R., J. Hannaway, Z. Xu, D.N. Figlio, and L. Feng. 2012. “Value Added of Teachers in High-Poverty Schools and Lower Poverty Schools.” Journal of Urban Economics, vol. 72, no. 2, pp. 104–22. StudentsFirst NY. 2013. Unsatisfactory: The Distribution of Teacher Quality in New York City. New York: StudentsFirst NY. Tucker, Mark. 2012. “A Different Role for Teacher Unions?” Education Next, Winter, pp. 16–20. Vergara v. State of California. 2014. Superior Court of the State of California, June 10. Whitehurst, Grover J., Martin W. West, Matthew M. Chingos, and Mark Dynarski. 2015. “The Case for Annual Testing.” Brown Center Chalkboard (Brookings Institution), no. 94. Winkler, Amber M., Janie Scull, and Dara Zeehandelaar. 2012. How Strong Are US Teacher Unions? A State-by-State Comparison. Washington, D.C.: Thomas B. Fordham Institute.